I have no desire to see any of you in a crumpled suit smoking ludicrously strong cigarettes or dressed as a mime but feel that I have to share some thoughts on French Dressing. The one you put on salad. Now frankly anything that comes out of a jar is a vile slur on the name of this noble mixture. I was going to try and find a decent ready made one but stumbled at the first hurdle, namely the first one I tried was so revolting that it shall remain nameless for fear of a lawsuit. So make your own, goddamit, it takes about 2 minutes. Take one generous teaspoon of Dijon mustard and pop it in your mixing vessel of choice (I have this spouty cup with no handle). 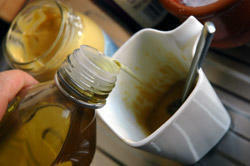 Take one tablespoon of white wine vinegar and mix with the mustard until you've thinned it out. You can use balsamic if you want a more caramel flavour and a darker dressing (I've used an apple cider balsamic to good effect). Now all it takes is 3 tablespoons of olive oil, your taste buds and wallet will dictate what kind this is. Now mix. It'll take 30 seconds or so of mixing to get it to bind together but then all that's left is pepper and salt. Done. You can mess about all you like from here on in, but generally I've found it best not to mess with the 3 parts oil to 1 part vinegar ratio. Bung in some raw garlic or chopped parsley if your feeling that way inclined. In our household, mustard overbears our vinaigrette. But we have to have it mailed to us from France. American mustard has no heat. We add a little chopped shallot if we have one.